At what point does the Word of God go from just believing to actually changing our lives? Do we stand on the premise that because the bible says so it must be so? Or do we take the Word of God and allow it to become a living platform upon which we build our lives? Whether you realize it or not how you answer those questions will forever not just once and for all times but on a daily basis will shape not only the present but your future as well. Of all the books in the bible one of the most powerful I believe is the Psalms. We are told they are “poems” and “songs” but for me they are much, much more they are the Word of God, Divine Invitations to a deeper spiritual life, Invitations to make a personal choice to not only believe in them but allow them to become a part of me, to become a new person. Take for instance this morning’s scripture. “The LORD takes care of the INNOCENT…” If you are innocent then the LORD will take care of you. But to be innocent requires you to make a decision to repent. What does repentance mean? The bible explains it this way. “Come now, let’s settle this,” says the Lord. “Though your sins are like scarlet, I will make them as white as snow. Though they are red like crimson, I will make them as white as wool.” (Isaiah 1:18, NLT) Isaiah 1:18 is no more than an Invitation to give up your relationships with sin in favor of a relationship with Jesus, who then makes us cleaner then new falling snow. “The Spirit is the one who gives life; the flesh profits nothing. 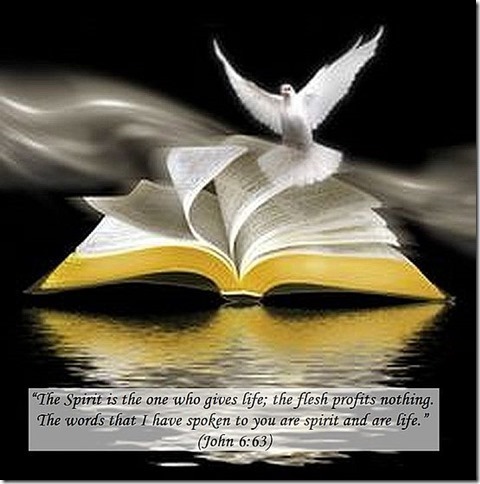 The words that I have spoken to you are spirit and are life.” (John 6:63, LEB) When we forsake our sins and create a relationship with Jesus the words of the bible are brought to life by the ministry of the Holy Spirit! After having said all of that perhaps the best way to ensure the words of the bible are indeed words powerful enough to become a Platform upon which God can change our lives is to first extend to the Holy Spirit the invitation to become our partner in reading the bible. But then you knew that already, didn’t you?